From the inception of the Supro Company in 1935 until its closing in 1968, no other brand of amplifier has had such a fascinating, mysterious and legendary story. The Supro® amps deliver the voice of rock and roll, from Jimmy Page’s legendary Led Zeppelin recordings or Brian Setzer’s early Stray Cat tracks, to the raging rhythm tones of Switchfoot’s Drew Shirley. If you have ever played one of these vintage amps then you know nothing sounds the same. No matter how high you take the volume, the amp delivers the same smooth but cutting tone that has shaped countless recordings over its 75+year history. The JHS SuperBolt overdrive pedal, at its heart, is a discreet circuit, designed to emulate the tone and character of the 1960’s-era Supro® amps. From its touch-sensitivity to the way the pedal sags with tube rectifier color at higher gain settings, the SuperBolt will give any guitar rig a versatile and useful new set of tones, reminiscent of some of the greatest sounds ever recorded. With 3 simple knob controls named Volume, Tone, and Drive, you will have the ability to make any guitar rig drip with vintage soul and attitude that no pedal has ever delivered- until now. To understand how the SuperBolt operates, let’s begin with the Drive knob. As you turn up the Drive, it’s like turning the volume knob on one of these small-box vintage amps; the more you turn it up, the dirtier it gets. Next, the Volume knob acts like what some would call a master volume. None of the vintage Supro® amps had this control, but it works perfectly for letting the SuperBolt get the dirty cranked-volume tones with the Drive knob and then backing down the loudness factor with the Volume knob. The third knob is the Tone control, fairly true to the designs in many of these vintage amps. Our Tone control will serve as a breath of fresh air to all of you who are tired of the unusable and treble-ridden tone controls out there. All the way up, it is a biting and sharp tone that is extremely usable and easy on the ears; all the way back, you will find a dark but well-focused range of tones, useful for jazz and more subtle styles. The Hi/Low toggle switch lets you toggle between Hi and Low gain settings, much like the High/Low input jacks found on many of the amps of the 50’s and 60’s. In the down (Hi) position, you’ll find huge amounts of headroom, more upper mids, more available dirt, and the most rock and roll that the pedal can offer. In the up (Low) position, cleaner sounds are available and a slightly darker and more mellow tone. The SuperBolt runs on a basic 9v supply, but internally it converts that 9v to 18v, for massive punch, headroom, and its overall powerful character. Do not attempt to power the SuperBolt with a 18v power supply. You will notice that the overall tone is open and full, without the compression found in many overdrives on the market. It will compliment a more compressed drive beautifully, and it stacks well with everything we have tried- and we’ve tried a lot. If you love boosting your amp into natural overdrive, you have never heard anything do this like the SuperBolt. It will literally make any amp into a fire-breathing dirt machine. If you want a classic tool for your guitar rig that can handle any style you throw at it, the SuperBolt is for you. We believe this is a truly unique pedal in a world full of overdrives; get a taste of something different today! That's actually more like a slightly modded Supreaux V.1 but with an added fat switch and the 18v converter. I'd designed a layout for the stock version myself (non verified yet or I'd have shared it with you guys :) ) But I guess I'll build from John's layout, since it's a little smaller and it has the "extras". THX! Can I use ICL7660CPAZ Instead of the LT1054? thank you John...lol I wanted to make sure befor I start. Wow, I really like how this pedal sounds and with various settings! I gotta try this one! Thanks! I didn't think on a LT1054 you could connect pins 1&8? I know you can on some others to get rid of the "whine". Also, is this based on the schem over at FSB? Thanks, been wanting to build one of these for awhile. I've used the LT1054 and 7660s's interchangeably with no issues. I prefer the LT since it handles a higher input voltage as well produces more available current. Has anyone built this and the Supreaux Deux? How do they compare sound-wise? Are they like two fine wines you could only tell apart if they were sampled one after another? Drain is supossed to be bias trimmed at 12 volt, 9 volts o even less? Thanks a lot. 9 volts sounds best on mine. How critical is the biasing? For instance, I have a 9.12v dc on pin 1 of LT1054 which gives me 17.62v on the 18v rail. Do I bias at 1/2 the 17.62V? Biased at 8.8, this pedal sounds amazing! I bought and sold a Silvertone combo with Jensons 15 years ago, if it had sounded as good as this pedal I would still have it! Coincidentally, Phil X just played through a Silvertone in his latest video on Fretted Americana, around the 2:45 mark. This pedal nails that sound and then some! i am building the Wampler Plexidrive at the moment, is this build close to it? or is the plexidrive more a les paul pedal and this a stratocaster pedal? Nothing like it. The Plexidrive is supposed to be emulating a JTM45, this is based on a 60s Supro amp. Think of the Plexi as British sound opposed to the Supro which is very American sounding. Both go well with either single coils or humbuckers. I guess if you want the Page sound a la 1969, go with a Tele into the Supro. With the Plexi and a strat you'll get Hendrix style. The Plexi with a Les Paul will be very 1974 AC/DC. Hi, Why does the layout says +18v? What does it mean? Thank you! it's there just to show where the +18V rail is. i guess the LT1054 converts +9v to +18v, so you have ground and +18v, maybe it's what they trying to say with it by write (+18V) on vero? Is the 100k trim required or will a 50k trim be sufficient? I don't know. it probably would but I never tried it. I just used the values posted in the schematic. So do you use a standard 9v boss type adaptor to run this? Have you guys compared the sound of this build with the sound of a real Superbolt? Is it very close? The Amp is a Supro Thunderbolt and it is being re-released in May, after Pigtronix bought the rights for the brand and set out to recreate these amazing amplifiers. I'm absolutely going to get one! They sound awesome! Exactly like my Silvertone 1443 amp, which is also made by Valco, and is now unfortunately too old to go on the road. The Supro re-release will fix that problem for me, as they sound pretty identical. When I fired up the Superbolt pedal the first time, I just started laughing... It sounded IDENTICAL to my Silvertone amp when pushed hard by a booster. ....and does it then also sound like a Supro amp? Hell yea it does! Without a doubt! I just love this pedal to death! The ROG Supreaux Deux is guaranteed to be my next build. I mean: does this sound exactly like a real JHS Superbolt? Have you compared? as long as schematic are 100% identical we should get close. if we have the voltages and hFE on the transistors we will nail it. what can they do with same components that we can't? it often depends on how much we get to know. but we can always listen to the sounds on youtube reviews and often they show us the settings etc. then we have to go from there i guess. BUT... when you tweek yours you can often get it better than stock cause it will respond just as you like it to do with your favorite guitar ;) and so on and so on... some buys 2 transistors of one sort, and on of another cause schematic says that, by doing that you need to be very lucky. i bought 100 transistors for my PlexiDrive build, okey they were cheap but i hope you get the point. i like better to build my own pedals then buy, as long they arent too complicated to build. i get a great time building them and can taylor made them just like it suits me, and i save loads of money too :) i can easy build 10 for the price of one new stock pedal. None of the ROG Supreaux circuits have a 22nF in series with the input. Right? I didn't see a 22nf on either circuit on ROG's site. I just breadboarded this, based off the schem put on FSB, and I really like it. It didn't have the nasty decay I couldn't get rid of on a couple of supreaux deux builds I did. Definitely gonna build this one up, starting the vero tomorrow. Thanks! just an FYI, the vero posted here was made from the FSB schematic. Just to be clear, I compared the vero layout, to the schem posted at FSB. I haven't compared this build with a superbolt pedal. you can use just about any diode (1N4001-4007/1N4148 etc) it'll just have a little lower voltage than when using the 1N5817 or a 1N5818. Finished building it, and this one is definitely going in a box. Biased all the trannys @ 9V and it sounds killer. Thanks John! If I commented twice, I'm sorry, it doesn't seem to be placed correctly. I was wondering: I see the name of the pots is changed to A500K, B500K etc. Is that american notation? So A500K is Log? Thanks! Thanks a lot! And thanks for all of this, really helped me build and learn a lot of awesome stuff. Hi guys, There's a half-moon shape (carved) on one side of my LT1054 (IC). There is also a half-moon shape (white) on the upper side of the LT1054 on the layout. Does this mean I absolutely have to solder the IC with the half-moon on the upper side of the layout, as shown here? In other words, is there a mandatory side for soldering the IC? Can the half-moon shape point either North or South? Hope I am clear. Thanks! yes, it IS MANDATORY! the 1/2 moon designates which way the chip goes in the circuit. if you flip it, it will fry the chip. I just finished the build and it works perfectly. Just saved myself another 200$ + tax. ;) Thanks guitarFXlayouts! Is this the trimmer to use? Looks great John. What color of enclosure/maker is that? it's a powder blue 1590BB from mammoth electronics. Thanks. What's funny is that I had a 1590BB (you must mean you have a 1590B, the small one) of those in the same color, but yours look much more pale in color. Could I use a tc1044scpa as the charge pump without modifying the layout? The pinout looks to be the same. Thanks! I am having issues with the tone control and toggle switch. The gain and volume work, but tone does not seem to change anything. Also, when I flip the mini toggle, the signal cuts out entirely. Any ideas? Thanks! there must be an error in your build somehwere. everything works exactly as it should. I have the same JD's problem with the tone control. Have you solved it? i know this is 3 years old, but any luck on fixing this issue. I've poured over the layout and the schematic and i'm not seeing the mistake. I have no response from the tone know or the cut switch. Which capacitor is tied to the toggle switch? I want to experiment with different values cause my build doesn't have the same affect as the Superbolt. there is no capacitor tied to the toggle switch. it's just adds or removes the 120K resistor for more or less gain. if built correctly, it should work exactly like the original Superbolt. mine certainly does. Love this build. Mine seems to be a little light on the low end and pretty bright even with the tone backed off (with tele). Any ideas to remedy these? Thanks! you don't have to do all of them, or replace them with as high of a value that I did, but I like mine a lot better with all of them being 100n's. Thanks John! I'll give that a try. I could see this pedal rocking pretty well on a bass. Would changing the cap after the gain pot (4n7 to ground) give more rolloff of the highs at its furthest point? how can i make my tone knob brighter when i turn it cw? it doesnt seem to get bright enough?can i change a cap somewhere to give it a little more high end? I'm having an issue. I built it and it acts as if there's a noise gate activated. When I send enough signal through it works, but when it decays to a certain point the sound cuts out. Any ideas? Also, what should those trim pots be set to? Full up? Full down? Thanks! the trim pots should be set to 1/2 of the power supply voltage on the drains of the transistors. I biased them all so the drains read 4.5V. Is this right? Also, the pedal works but there is a horrible whine when I'm not playing. The highest reading I can get on any of the transistors is 9V. I used the 7660.
they should be trimmed to 9V. it's sounds like your charge pump is not supplying 18volts to me. Thanks so much for your help, John. It ended up being that there was a little bit of solder shorting a couple of the pins on the charge pump. I was able to bias two to 9V and the other would only go down to 10 for some reason. Either way, it sounds great now! Just built this. Works great except there's a really unpleasing high pitched whine. Could this be from the charge pump circuit? I used ICL7660, and 2.2nf caps in place of 3.3nf/4.7nf (all I currently have on hand. Allthough could someone enlighten me about the biasing, i set them on about 9 V but tried some other setting and at one point i thought it sounded much grittier and barkier and 5,5 V, might have lost some of the cleaner more headroom qualities, but hard to judge because thats so interactive, change something on the bias, adjust drive and everything changes again. Nope. That would need an input voltage of >20V. And the layout isn't accepting a regulator as it is. Do an ebay search for ICL7660S. Remember the "S". That's important. Using this pedal alone is okay but when I push this pedal or push with this pedal, so basically stacking, i hear this white noise. I have just finished one! Super nice sounding device, I love that treble shimmer on top! Using a multimeter, set it to measure DC volts, put the black probe to a ground point and the red probe to the drain of a FET. Then turn its trimmer until the drain voltage reads 9V. Repeat for each FET. I recently built this, without the voltage "pump", basically I built the runoffgroove supreaux. I get PLENTY of volume, and the tone control is good, too, but there's not near enough gain. I've played a JHS bolt, but somethingg's lacking in the gain on my build. checked and double checked, it's all there. will higher voltages on some of the jfets add more gain? I should say, I'm running 9v power, with 5.5 v on the drains. How high can I go with 9v supply? can I bias each drain up to , say , 8v? no. if you don't have the pump, and you're running on 9v, then drains should be round 4,5v-5v (trust your ears on that) . thanks, I have it dialed in pretty good now, It just seems that when I've played the JHS bolt, it had a more growly , more distorted sound. I can squeeze a couple classic zeppelin tones out of mine as it is right now, so I'm gonna leave it like it is. I've got the drains at about 5.9V, running off of regular 9V supply. I swapped out the volume control to a 50K linear pot, because with a 100K I could barely turn it up from zero, it got so loud, so quick. The 50K helps, but it still can't go past half way without being the loudest pedal on the board. Yes, get more J201's from another seller/ batch. So I just finished it and in mine a 7660s didn't work (high pitched whine), both while LT1054 and tc1044s worked perfectly. Thanks for the great work guys! I'd recommend bringing power in via a 100r resistor to diminish the humming of the pedal. Also added a 100nf cap parallel to the 100uf. Seems to help! Built this but it's a tad bright and I'm losing a lot of bottom end. How can I fix this? What caps would I swap to higher values and which values? 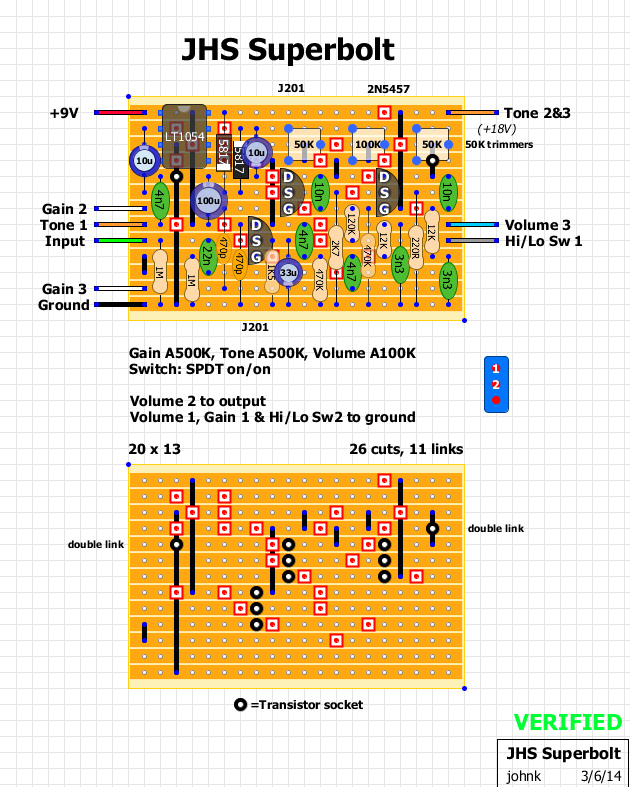 What I've just recently done was adding a bass boost switch based on the schematic for the RunOffGroove Supreaux Deux. It consists on an extra capacitor (you should try different values to suit the amount of bass to your taste) and a 1M resistor. Wanted to share that i have built three versions, the supreaux (9v), did not like that, the supreaux deux (from a musikding kit to save time), has more bottom end, very similar charakter but i really like this one the best, hast just that special voicing. JHS may be a cloner but this one turned out fine even though its more or less the supreaux (one) with 18 V and very small differences. I also dont like the fact that i loose a lot of bottom end, maybe i build another and socket all the caps to check if i can get that and still not loose that special voicing. Great Box, lots of fun !!! I've found that even with the volume pot turned all the way up, it only gets about as loud as with a bypasses signal. Also, on the LT1054 none of the pins have 18v. 1 and 8 both have 9.2V. Are both of these normal or did I screw something up. My JFETs all biased to around 8.9V. you screwed something up. you should be getting close 18V from the charge pump. I noticed I had 17.5V on another row when randomly checking different points. What pin on LT1054 should have 18V? No idea what I did, but it works now and is VERY loud. Sounds pretty good, definitely when the tone control is rolled back, otherwise a bit harsh. The above question about Caps was mine, no idea why it says "Unknown". Anyway, hello everyone! ha. I could be wrong, since I'm not looking at the schematic, but I believe the 100uF is getting 9V and the 33uF is getting 18V. Personally if a circuit is getting 18V anywhere I wouldn't use any cap rated lower then 25V. It takes away the guessing and limits the amount of possible issues. I also don't use caps rated lower than 25V in general this way I never second guess it and grab the wrong ones. Thanks for the quick reply! I figured the 33uF was getting the full voltage. This is my first charge pump build and it occurred to me that the cap assortment I bought has a lower V rating for the higher uF caps. Oh well, off to wait on the mailman. Thanks again! TC1044's... never had any luck with those. Sooner or later they always get fried. I've had better luck with ICL7660S IC's. any ideas why the chip is heating so fast? i cant figure that out. It usually happens when you have a unwanted solder bridge. Its really doubling the voltage? Did you check it with a multimeter? Since they're rated for 15v input, I'm assuming your output pin's voltage (18v) is somehow bleeding back through your input. That would absolutely fry it right up. Some conductive mischief is on your board! well I didn't socket the transistors, maybe I burned them? I've checked for solder bridges - nothing that I can find. I've checked the IC, all is will and I'm getting 18v on the 18v rail. I'm now checking connectivity with my multimeter, but I'm a little stumped on how to go through this board to check it piece by piece. I'm definitely not getting connectivity through the input and output or even the 9v and ground on the board. Anyone have suggestions on how to go through the board and troubleshoot it?